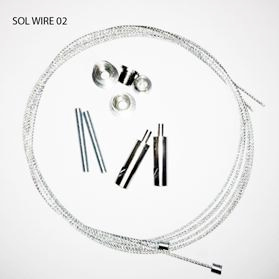 SOL WIRE 02 set is for the direct hanging of single lights without using a rail kit. Suitable for SOL or HYDRA lights ONLY, due to the specific thread length. Installation: Threaded studs screw into the slider barrels and then into the two holes in the heatsink. The wire is fixed to the ceiling using the ceiling adapter. Note that fixing screws are not supplied, as the choice of fixing will be determined by the specific ceiling structure. The wire passes through the slider barrel to allow for continuous height adjustment. Suitable for SOL/HYDRA/VEGA when used with a D-D RAIL KIT. Installation: The balls on the ends of the shorter wire are designed to slide along the round section slot on the top of the D-D RAIL KIT. The shorter wire is then positioned on the end of the slider barrel by removing the screw, inserting the wire and holding into position with the screw. The main suspension wire is fixed to the ceiling using the ceiling adapter. Note that fixing screws are not supplied, as the choice of fixing will be determined by the specific ceiling structure. The wire passes through the slider barrel to allow for continuous height adjustment. Almost identical to the SOL WIRE 02 set but only suitable for use with the VEGA light due to the specific thread length. Installation: as per the SOL WIRE 02 kit. The MKII controller is suitable for use with all models of lights in the AI range. 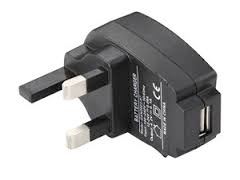 For use with a SOL light connect using the 3.5mm jack plug on the data lead supplied. 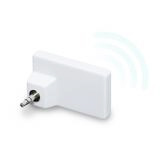 Alternatively by purchasing an optional WIRELESS ADAPTER and USB ADAPTER you can connect to the SOL light or lights wirelessly. If connecting via a data cable to the SOL then the controller will not need an additional power supply as it takes this from the sol light. 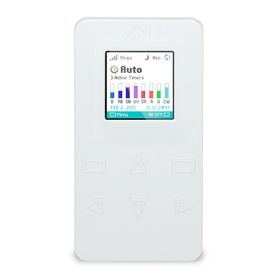 If you use the SOL with a wireless adapter then you will require a USB PLUG ADAPTER to provide power to the controller, as there will no longer be any wired connection to the lights. Wireless adapters will provide the SOL light with a wireless connection to the MKII wireless controller. They are not required for the HYDRA or VEGA lights. The adapter simply plugs into the existing data port on the SOL light. 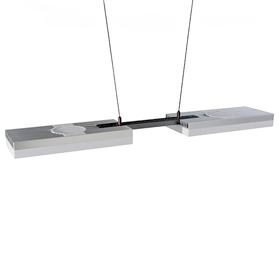 Part Number: EXT 6, EXT 12, EXT 18 in anodised silver or EXT-6BK, EXT-12BK, EXT-18BK in black. The hanging wire kit that screws into the EXT RAIL is EXT-HK. Suitable for SOL, HYDRA and VEGA light units. 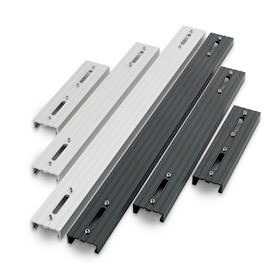 The EXT RAILS are available in 3 sizes – 6”, 12” and 18” lengths and connect lights together without using the D-D rail kit. 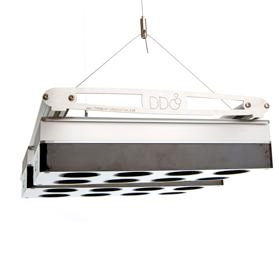 They are available in either black silver anodised finish to match the heatsink. 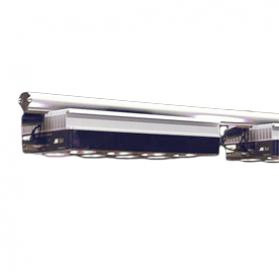 The EXT rail can be either suspended using the EXT-HK hanging wires or tank mounted using a tank mount set. SOL WIRE 02 or VEGA WIRE 04 hanging kits by screwing the threaded stud on the kit into the available bolthole on each end light. This optional bracket allows the EXT RAIL to be fixed as shown directly to the cabinet. 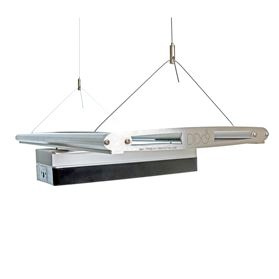 The 48” mounting set consists of the upright bar and fixing bracket, and can be combined with the appropriate EXT RAIL in either 6”,12” or 18” depending on the width of the tank. To install this bar to the cabinet it is necessary to have access to the mounting position to screw on the support block. It is possible to fix to the side of a cabinet if required. These extremely popular rail kits are ideal for hanging multiple lights with ease using just one SOL WIRE 03 set to hang the rail. 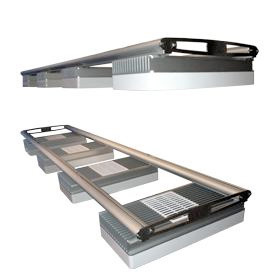 Rail feet are also available however the short height of these feet require consideation when mounting to ensure that the light is not mounted too close to the water. 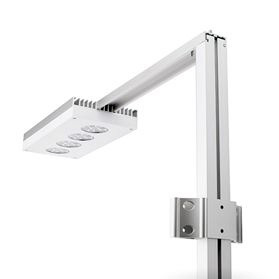 Rails are available in 2,3,4,5 and 6ft lengths as either the conventional double rail set for lights to be suspended width wise, or a single rail set for lights suspended length wise. The rails are supplied kit form and incorporate a built in cable channel to allow you to neatly route the power leads to the end of the rail. 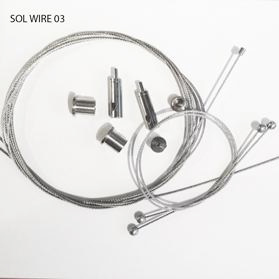 To suspend either the single or double rail kit please use the SOL WIRE 03 wire kit. The full length slot on the top of the rail allows you to slide the wires to any position which adds to the flexibility during the installation stage.